Teaching a new module, especially one as complex as climate, can feel overwhelming. In the segments below you will find helpful hints and tips from seasoned educators on to how to prepare to teach these modules allowing you the opportunity to maximize your experience with these modules. Our climate system appears as an atmospheric process, but it is driven by solar energy and results from interactions among all components of the Earth system, including the oceans and land, the biosphere, the atmosphere, and Earth's frozen waters—the cryosphere. All students should read Earth System: The Basics (Microsoft Word 2007 (.docx) 151kB Jun6 12) before starting one of the Climate modules. It is short and introduces basic Earth system concepts, processes, and vocabulary in simple terms. Key practices advocated by A Framework for K-12 Science Education and the Next Generation Science Standards include students asking, refining, and answering their own questions, and developing their conceptual models of scientific phenomena. Launching a new module, includes engaging student curiosity, and creating interest in the subject at hand. In support of these key practices, we encourage you to launch any one of the climate modules by asking students the following set of questions and recording their responses, without judgment, on large sheets of paper for future reference. This can be done on a day prior to starting the module, or immediately prior to starting the first Lab of the module. "What is the Cryosphere (or Biosphere, or Carbon Cycle)? "What is the relationship between Climate and the Cryosphere (or Biosphere, or Carbon Cycle)? "What effect does climate have on our lives...right here, where we live?" "What questions do you have about climate or about the Cryosphere (or Biosphere,or Carbon Cycle), or about the relationship between them?" Each of the four Climate Literacy modules has a set of clearly defined objectives. You'll find them on the Educator web site as well as on the Student web site for each module. There are also four major themes that cut across all three modules, themes that appear in different contexts in each of the modules, and that are essential to the development of climate literacy. The major cross cutting themes are described below. Each of the modules in this series addresses climate and climate literacy in the context of the Earth system. If students are familiar with the basic Earth system ideas, they will better understand the references to reservoirs, flux, residence time, and other Earth system concepts as they work through a module, and ultimately they will have a deeper understanding of our planet's climate. Be sure to carefully read the brief paper "Earth System: The Basics (see link above), and take every opportunity to highlight Earth system dynamics as you implement the module. This paper is also included in the Student web site of each module. The time scales and rates of change associated with Earth system and climate processes can be challenging to comprehend. How do we grasp a process that takes 10,000 years to complete, or put into context an event that took place millions of years ago? One goal of the Climate Literacy modules is to help strengthen student understanding of these larger-than-life time frames, which often involve rates of change that can seem extremely slow but that nevertheless produce dramatic results. Here is one simple example of slow change that most of us can relate to. If your soup needs some salt, you are likely to want to make that change quickly by turning the saltshaker upside down and giving it a few shakes. However, the soup will get just as salty if you shake that same amount of salt into your hand and then add it to the soup one grain at a time, but that might take 15 minutes. If you added one grain of salt each hour, or one grain a day, or month, or year, the soup would eventually get just as salty—the change will be the same (if you kept the soup from evaporating, and lived long enough! )—but it would take significantly longer to get there. And along the way, if you sample the soup once in a while, it's unlikely you'd notice the change because it is so gradual. Natural Earth system processes, like the examples of salting the soup, happen at very different rates. A tornado can develop quite quickly, like shaking the salt directly into the soup. Other processes, such as the changes in Earth's tilt and orbit that usher in a new ice age, happen so gradually that we cannot really sense the coming change in the human lifespan. It's like adding the salt a single grain per year. Ultimately the change can be dramatic, but noticing the incremental change along the way (in the context of a human lifetime) is not likely to happen. Earth system and climate processes occur at various spatial scales, but as with time scales, some are more difficult to grasp than others. We can observe local processes, but understanding their impact when they occur at the global scale (e.g., the decay of leaves) is beyond what our perceptions can readily imagine. In addition, climate can be defined at any spatial scale that is pertinent to our interest. If we are planting a garden along the south wall of a house, the microclimate of those few square meters becomes very important to understand. Climate can also be defined at the local, regional, continental, and global scales. Scientists who study the global climate depend on data that is collected from thousands of stations as well as satellite instruments. 4. How do we know what we know? Throughout the Climate Literacy modules, be sure to highlight the data scientists use to support their claims as well as the instruments and procedures scientists use to collect that data. Science is the set of practices used to support the study of the natural world. To appreciate and trust the work of science, students need some understanding of the practices scientists use to build new knowledge. Those practices include collecting and analyzing data. Data can take many forms, and can include direct evidence in the form of photographs, satellite data, field samples, and real-time measurements of temperature, atmospheric carbon dioxide levels, etc. Scientists have also learned how to interpret proxy data—data that provide indirect but compelling evidence of Earth conditions or processes that occurred thousands or possibly millions of years ago. For example, the presence of fossilized pollen in a location provides direct evidence of the existence of plant species in that general location, but it also provides indirect evidence of that location's climate at some point in the distant past. Discussions provide students with important opportunities for formulating, consolidating, and communicating their thoughts—processes that are key to the scientific enterprise. They also provide students with opportunities for critical thinking as they discuss and evaluate ideas they have read or heard, or as they analyze the results of a lab experience. Take full advantage of the opportunities for classroom discussions, both those that are highlighted in the curriculum as well as others that present themselves during the module. It is time well spent. Suggestions for focusing each classroom discussion are provided on the Educator's pages under Teaching Notes and Tips. You'll find plenty of articles and studies on the Web that address the growing consensus that discussion plays a key role in the science classroom. Links to several resources are provided here. Climate and climate change involve complex processes that are poorly understood by many. Yet these topics are being widely discussed, and understandably there is a lot of confusion and misinformation about them. While uncovering the specific misconceptions of your own students is a valuable thing to do, it is also helpful to understand what some of the more commonly held misconceptions are. The resource Realities vs. Misconceptions About the Science of Climate Change (Acrobat (PDF) 429kB Jun6 12) not only identifies several of the commonly held misconceptions about climate and climate change, it also provides a wealth of accurate background information related to those poorly understood topics. The Lab Overview page on the Educator web site includes a list of software, equipment, and materials that will be used in each lab of the module. Please check this carefully before you start teaching the module. Gather the necessary equipment and materials necessary for the hands-on labs, and make arrangements to install any required software on school computers. Doing this ahead of time will save you valuable class time (and potential headaches) later on. While the entire EarthLabs curriculum is computer-based, it is not necessary for students to have continuous access to a computer. The Lab Overview page on the Educator web site indicates those class periods when student access to a computer and the Internet is a high priority. 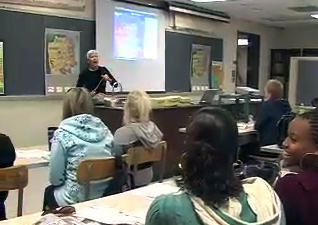 Even if your students have unlimited access to computers, you should decide when it makes most sense to use a single classroom computer and projector (e.g., to show a video), when you'll want students working on their own computers, and when it's best to have no computers available (e.g., provide printed copies of lab procedures to your students vs. having them follow procedures from a computer screen).